Baby food has come a long way since my kids were infants. Back then it all came in glass jars and was not the easiest to travel with. I wasn't as savvy as I am now then either. Though I did check ingredient labels, I didn't know the importance of organic ingredients or to check for thickeners and such. I wish I'd known then what I know now. Now moms have great options available when choosing what to feed their little ones. One of those options is Baby Gourmet natural, organic baby food. The resealable packaging is BPA free and extremely portable. You can easily squeeze it out by the spoonful for younger ones or hand it over to older babies and let them feed themselves. The food itself is organic, contains no added salt, sugar, thickeners, or fillers. Company founder Jennifer Broe is a mother committed to feeding her children food that is both nutritious and delicious. 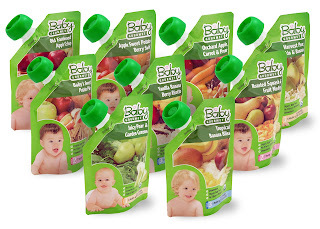 Every batch of Baby Gourmet is taste tested and poured out if it is not absolutely perfect. Each recipe starts out in real kitchens and it shows in the creative varieties available. I received Tropical Banana Bliss to review. I was pleasantly surprised to find food that not only smelled great, but tasted delicious. Yes, I tasted it myself. I shared with a friend's son too. Garrett is a notoriously picky eater, but absolutely devoured the Baby Gourmet food. After sampling it and reading up on Baby Gourmet, I would absolutely recommend this to those looking for a tasty, health food for their infant. TexasHousewife.com Product Review Disclosure- I have received no compensation from Baby Gourmet other than the offer of free product to review. Any opinions expressed on TexasHousewife.com are my own. My reviews are never reviewed or edited in any way by sponsors.